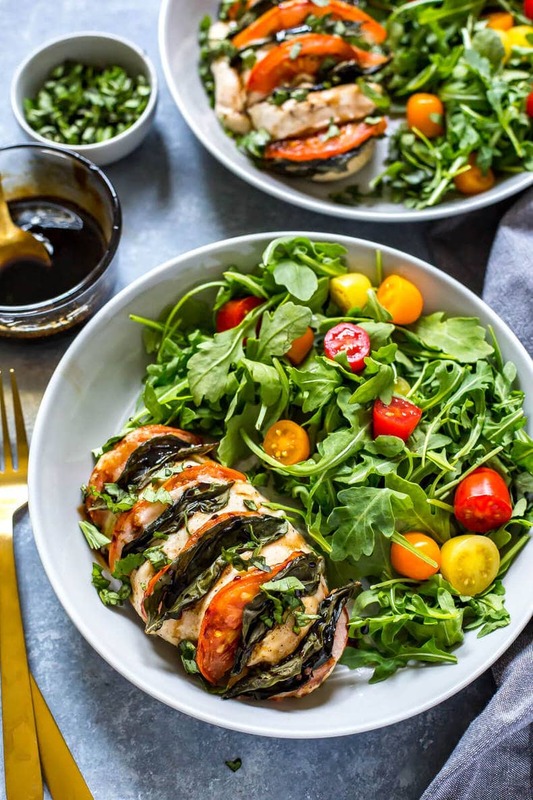 This Hasselback Baked Caprese Chicken is like summer on a plate – with mozzarella cheese, sliced plum tomatoes and fresh basil, it's topped with a balsamic glaze and served with an arugula salad for a healthy, gluten-free dinner! 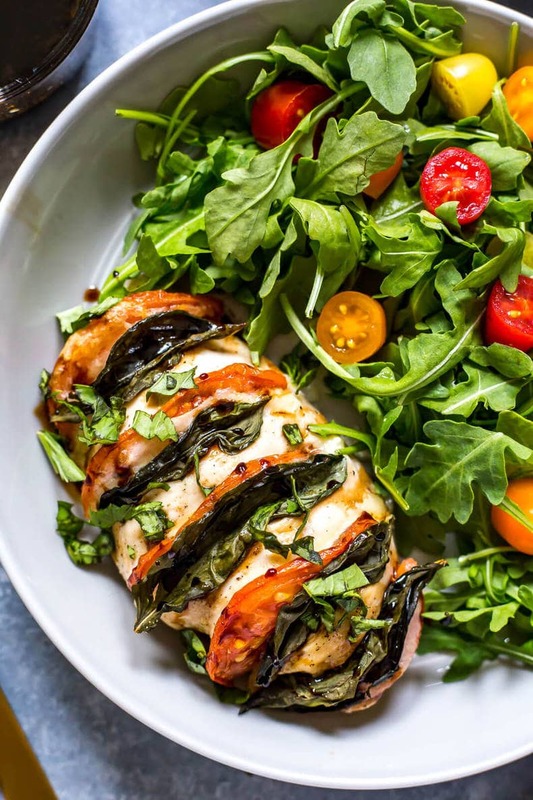 I am in LOVE with caprese all year round – whether it's as a salad, a flavour profile for chicken, steak or shrimp, on a pizza, as a sandwich..basically I could eat it any which way. Gimme the mozzarella/basil/tomato combo with just a little bit of balsamic glaze and you've got me sold. 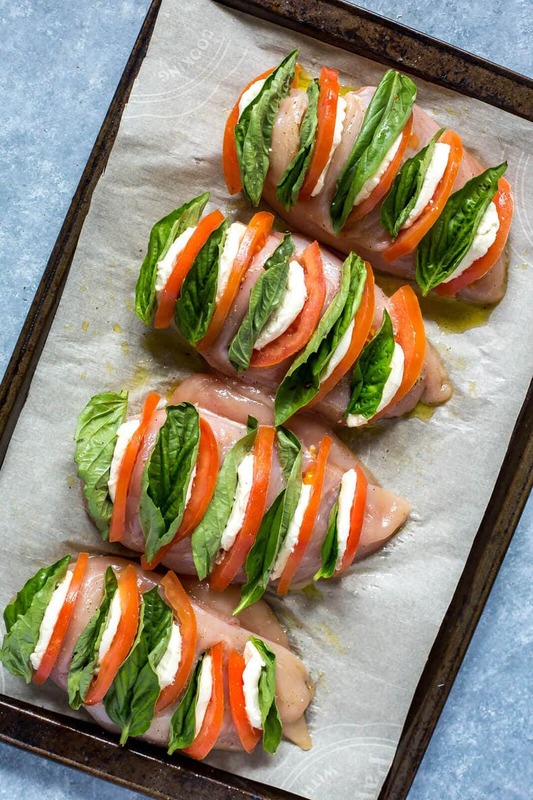 So needless to say I was excited to take my fave way of enjoying chicken lately (the hasselback method) and stuff a bunch of caprese ingredients up in all the little slits. Hasselback chicken is sooooo easy to do and you can basically create any type of flavour. 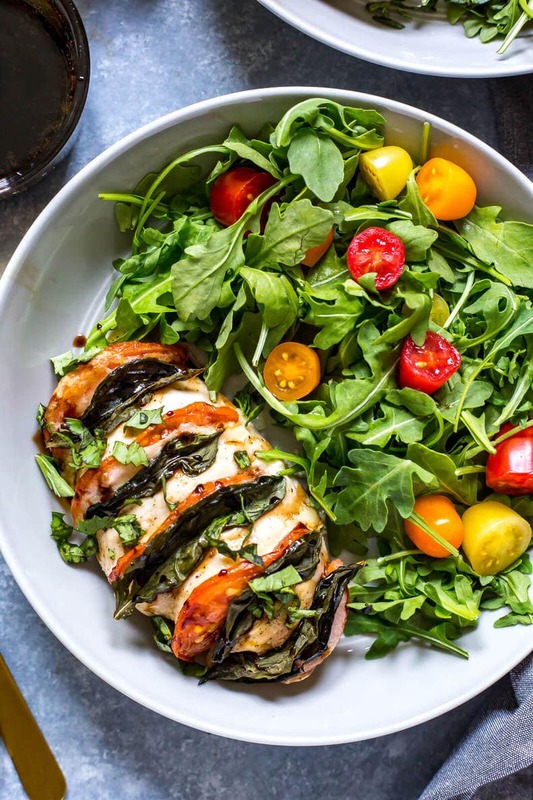 I should know: I've already done Fajita and Jalapeno versions of Hasselback Chicken and it's just such a great way to get a ton of flavour jam packed into what is usually an ordinary chicken breast. I also find the chicken tends to cook a bit quicker this way too so you can eat sooner rather than later and let's face it: that's always a bonus right? 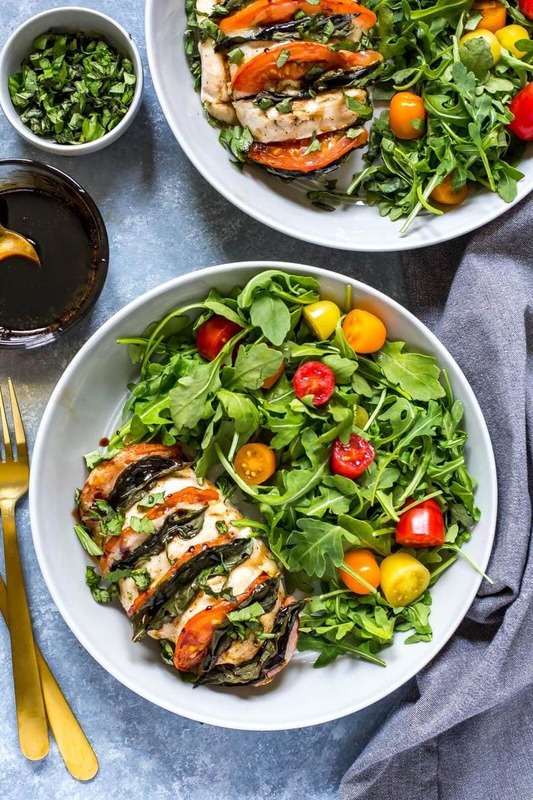 So the first step you want to take with this hasselback caprese chicken is to ensure you have the right ingredients. I always like to use plum tomatoes because they stay a bit firmer and give more of that juicy flavour, and they're likely in season wherever you live during the summer. That's not to say you couldn't use vine, hothouse or beefsteak tomatoes, and heirloom tomatoes would also be an amazinggggggg choice. Go with what you like in the tomato department! In terms of cheese, I always buy a log of fresh bocconcini-style buffalo mozzarella because you can more easily cut off slices to stuff within the slits of the hasselback chicken, but shredded mozzarella works fine if you already have some on hand, or you can use the smaller bocconcini cheese balls, but you'll probably have to cut them in three and stuff more inside. The key to hasselback chicken really is slicing all the ingredients for the filling as thinly as possible so you do want to ensure you can do that before stuffing it all in there. Lastly, make sure you use fresh basil because it makes a HUGE difference! 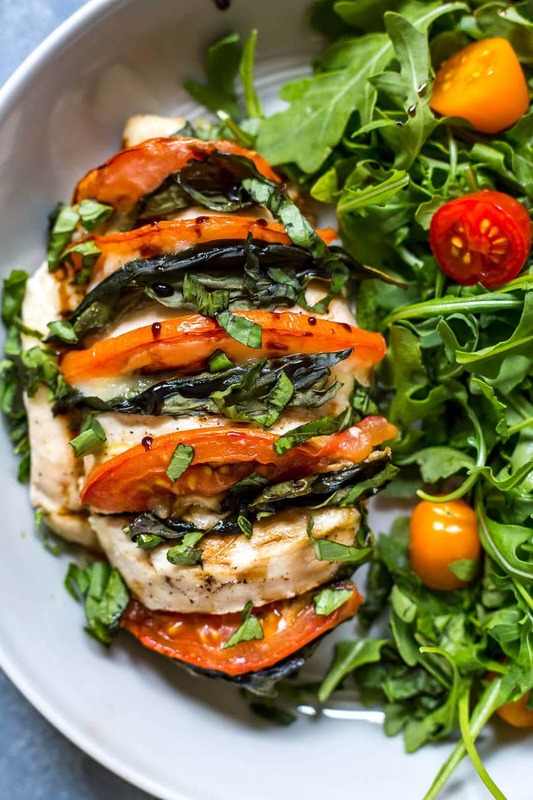 I usually put some in the oven to bake, and then I sprinkle some extra along the top of the caprese chicken along with the balsamic glaze as sort of a last minute finish and to re-inject that flavour once it's all done cooking. Fresh basil in the summer is my fave. Beyond the basil and balsamic, you don't really need to worry too much about extra seasonings. I coat the chicken with a bit of olive oil, salt and pepper then I bake in the oven for 25-30 minutes (less if you're only doing two chicken breasts). Simplicity is the key here. It is summer after all, and you want to get outside and relax, not worry about slaving away in the kitchen right? 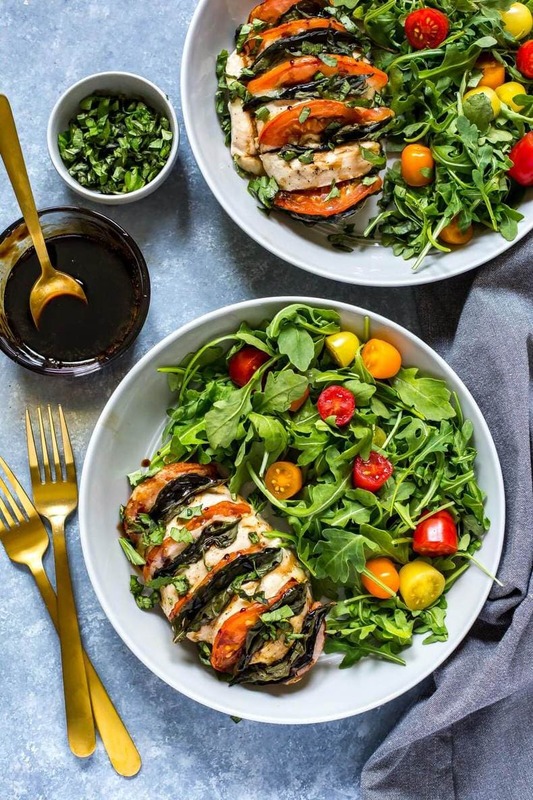 Finally, it's just the balsamic glaze that you need to get in order. I'm pretty sure you can buy some pre-made at the grocery store (should be where all the oils, dressings and vinegars are) but you should also be able to make it at home pretty easy as well. I always boil a bit of balsamic vinegar with some brown sugar on the stovetop for about 10 minutes and that usually provides just the right thickness and sweetness to complement the cheese, tomatoes and basil. Finish with some sea salt and fresh cracked black pepper and you've got the perfect chicken dinner! 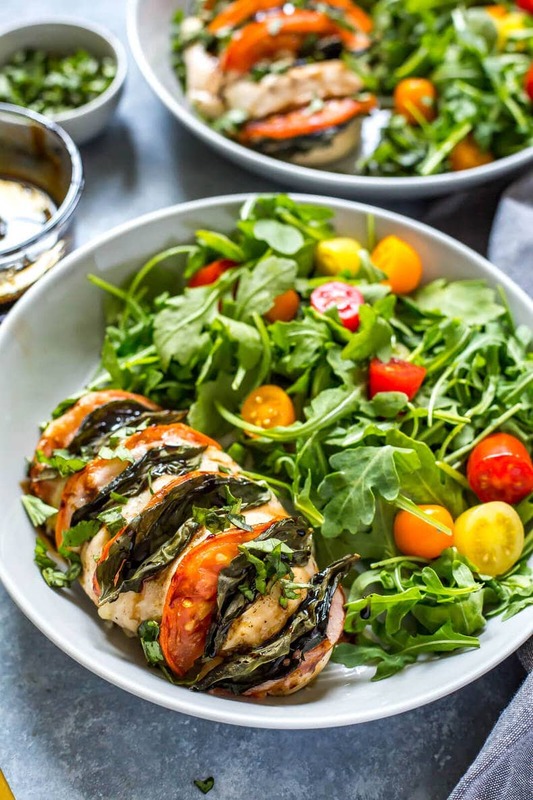 Will you be making this Hasselback Baked Caprese Chicken? 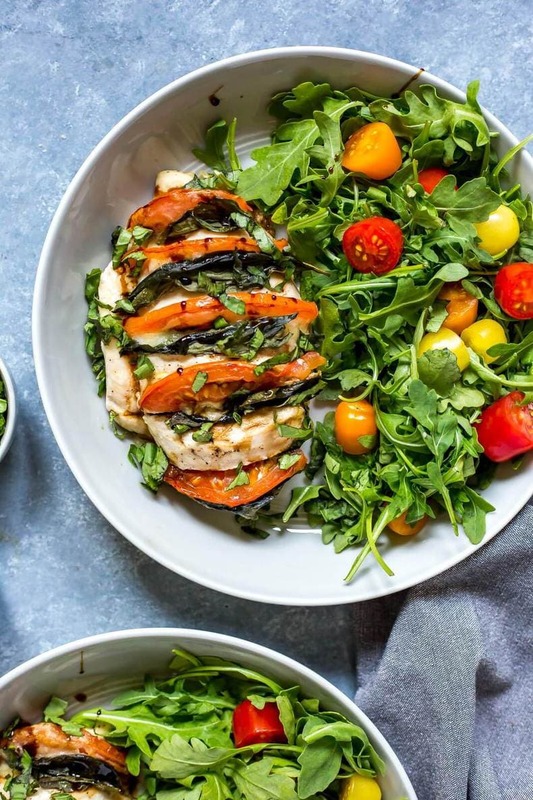 It's such a fun, delicious way to dress up ordinary chicken breasts and a great way to also get your veggies in! Enjoy this healthy, fresh dinner idea – it's going to become your next go-to this summer! You'll need a good knife set to get some good cuts in your chicken breasts. Preheat oven to 400 F. Make deep, wide horizontal cuts across each chicken breast (see video if you're unsure how!) Rub chicken with olive oil and season with salt and pepper. 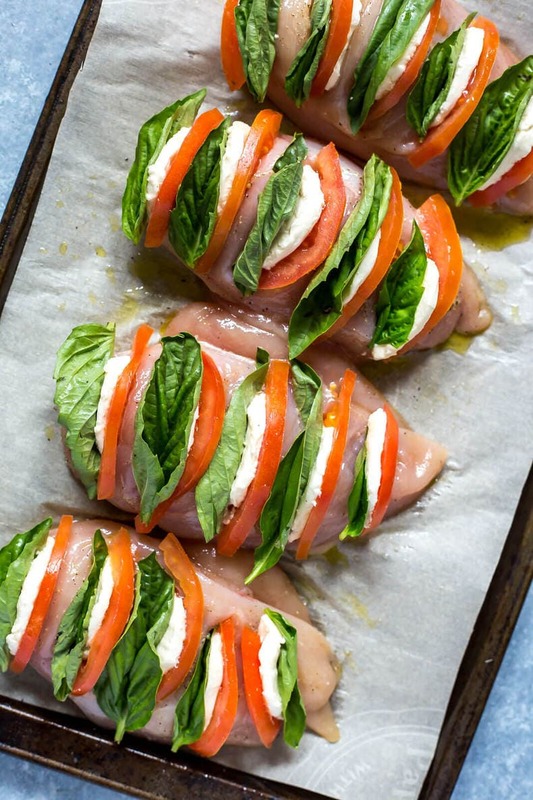 Thinly slice tomatoes and mozzarella, then stuff into cuts in each chicken breast, then add basil in each cut. Bake in the oven for 25 minutes or until chicken is fully cooked. Meanwhile, bring balsamic vinegar and brown sugar to a boil in a small pot on the stove. Cook for 10-12 minutes on medium heat until mixture has thickened. Set aside. Take chicken out of the oven, and drizzle with balsamic glaze. Garnish with extra fresh basil if desired and serve with a salad or side dish. Enjoy!